While there is no one thing that will make your yard look bad, there are a number of bad things that, when added up, cause your yard to lose its aesthetic charm. One such thing is a tree stump. Tree stumps evoke a combination of melancholy and laziness. They not only signify the departure of a once beautiful tree, but also signify that fact that you didn’t have the wherewithal to complete the tree’s removal. You may be thinking: who cares? Well, there are more than just aesthetic reasons to get rid of your tree stumps. 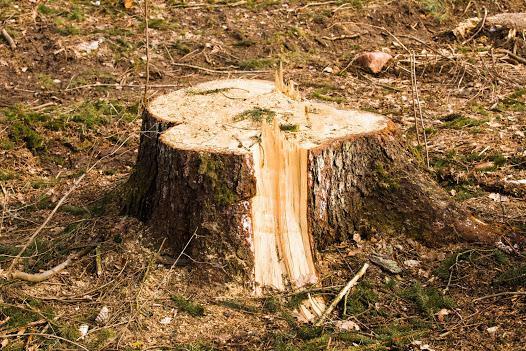 Here are 5 reasons to remove stumps from your yard. Perhaps the most common sense of the reasons to remove stumps from your yard is that stumps are safety hazards that could potentially lead to injury. After all, a hard, solid, entrenched piece of wood that sticks around a foot out of the ground is easy to trip over. This is especially true when it gets dark and you can’t see what’s around you. Tripping over a stump might not seem like a big deal, but it could lead to serious injury. Your best bet is to just remove it entirely so that you can roam your yard without fear of hurting yourself. As was noted above, a stump is about as unsightly as anything that could ever appear in your yard. Whereas trees display beautiful leaves, stumps display the eradication of these leaves. By removing stumps, you will not only improve the overall aesthetic of your property, you will potentially even increase the value of your property. No one wants a massacred tree sitting lifelessly in their yard. It’s simple. Remove the stump and improve the appearance of your property. While some people enjoy mowing their lawns, for most, it’s an annoying chore. You don’t want to make it any harder of a process than it has to be. And for this reason, you should remove the stumps in your yard. Stumps are nothing more than another barrier to mow around. They prevent your ability to mow in a straight line, thus increasing the time it takes to get the job done. Eradicate the stumps, and mowing the lawn will be a lot less of a hassle. Did you know that a tree can grow back after it’s been cut down? Well, it can. That is, as long as you keep its stump entrenched in the ground. In addition to growing back into a tree itself, a stump can also cause new trees to grow in its general proximity. While there’s a chance that you want this, there’s also a decent chance that you don’t. If you don’t, you would be best served by removing the stump and its roots entirely. While you could conceivably use your stumps for a purpose, odds are that you won’t. They’ll probably just sit untouched in the middle of your yard, doing nothing more than taking up space and destroying the overall aesthetic of your property. Think about the things you could replace your stumps with. Maybe you’re thinking about building a new shed? Maybe you’re interested in starting a garden? By eradicating your stumps, you free up plenty of space to accomplish these things. Looking to Remove Stumps From Your Yard? Do you have a stump or two taking up space in your yard? Are you hoping to get rid of those stumps? If so, you’re in the right place. We here at Smitty’s Tree and Arbor Service have all of the knowledge and resources needed to extract your stumps in a quick and professional manner. Our licensed team of workers is beyond experienced in the process of stump removal, and will have your yard looking newly born. Contact us today for an estimate!